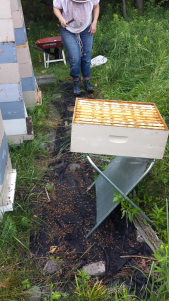 Today I had my helper with me again. 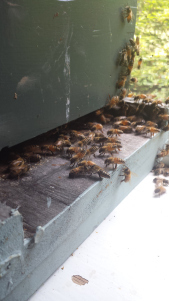 We did a routine inspection and found that the girls were bringing in a good amount of honey and filling in most of the new comb they had drawn on the added super. 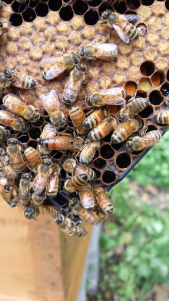 The term "super" usually refers to a box of fresh frames or drawn comb that is added to a hive during a honey flow in order to give the bees storage space to support the rapid influx of nectar. 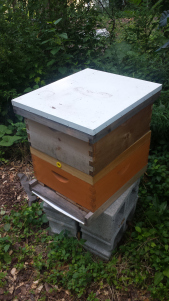 Supers can be medium or deep boxes and have no physical difference to a regular Langstroth hive boxes other than the name used to reference its use. 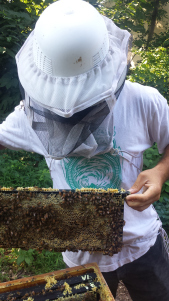 It was so beautiful out today, so I decided to bring my 6 year old nephew to the apiary with me. 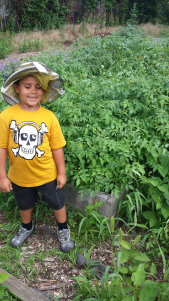 He is always such a great helper and learns very quickly. 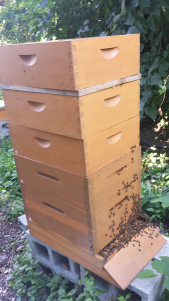 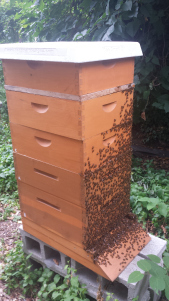 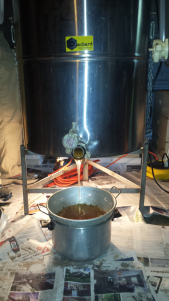 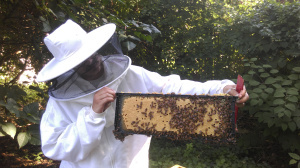 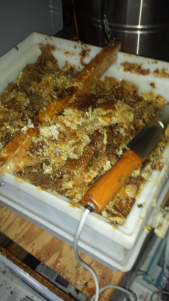 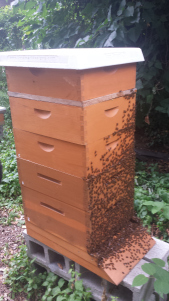 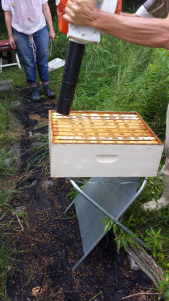 I have also added a couple pictures of some of our girls bringing in propolis to the colony. 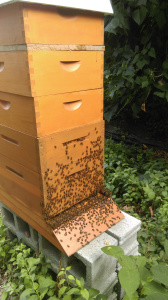 From wikipedia, "Propolis or bee glue is a resinous mixture that honey bees collect from tree buds, sap flows, or other botanical sources. 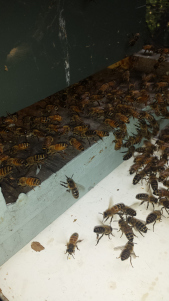 It is used as a sealant for unwanted open spaces in the hive." 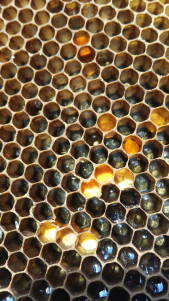 This substance also acts as a natural antibiotic that creates a hygienic barrier from the outside world. 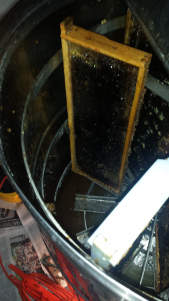 It has a particularly high frequency and minty smell to it. 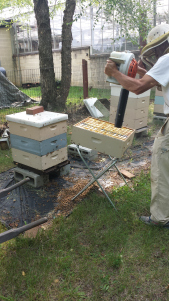 Queen rearing class with Jeff Eckel from Instar Apiaries. 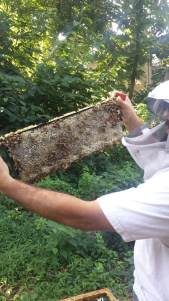 Jeff manages the bees at the Wyck House and a few other locations and has lots of experience rearing Varroa Sensitive Hygenic bees. 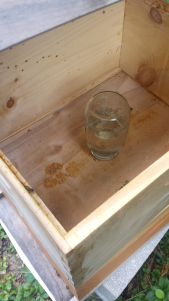 In this class we grafted 24hr old larva (hatches after 3 days as egg) into queen cells and primed them with royal jelly from a dropper. 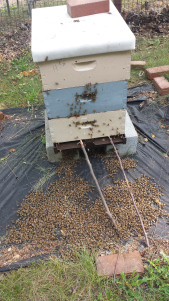 Suprisingly, the queen bars and cells can be handled upside down and will not fall out. 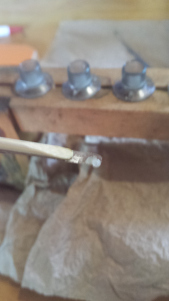 One must take care to keep the larva moist while handling and completing the grafting process. 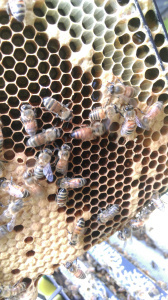 Supercedure queen cell found. 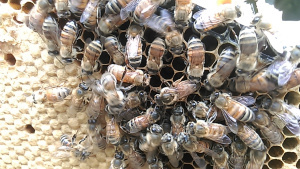 This indicates that the colony is unsatisfied with the egg-laying performance of their current queen and are therefore ousting here to may way for a more favorable queen. 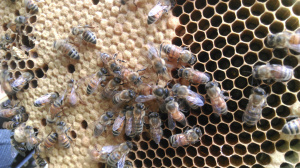 Honey bees make supercedure queen cells toward the center of the frame as opposed to swarm queen cells, which are usually found toward the bottom of the frame. 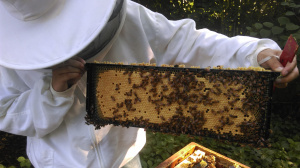 In any case, all queen cells are drawn vertically and are much larger than those of regular worker cells. 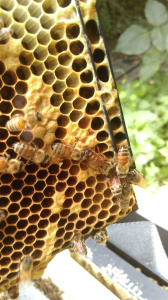 Queen Found. 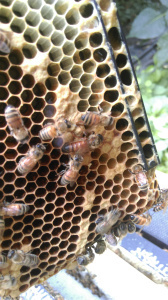 This queen would soon be superseded by a new queen which had a much better brood laying pattern than the previous one.